Harold Camping proclaimed the Lord’s return would be in 1994! Harold Camping now proclaims the Lord’s return will be in October, 20, 2011! In 1992, Harold Camping published 1994?. Like Miller, he rejected the historic understanding of Daniel 8. The prophecy clearly describes the rise of the kingdom of Greece under Alexander the Great, and the division of his empire among four others. But instead of seeing the prophecy as fulfilled then, Camping transports its fulfillment to our own day. Like the Adventists and the Jehovah’s Witnesses, he focuses on the “hidden” meanings of texts, seeing pointers towards 1994 in the number of swine drowned in the Sea of Galilee or in the number of servants in Abraham’s house. Camping introduced 1994? with the following statement, “No book ever written is as audacious or bold as one that claims to predict the timing of the end of the world, and that is precisely what this book presumes to do.” As audacious as it was, it was wrong. September 6, 1994 came and went. Camping seemed to back away from his false prophecy, but he has now decided he was right all along. It was too bitter a pill to swallow to be wrong. Like the Jehovah’s Witnesses, he says 1994 wasn’t the wrong date. We just have to add 7 years to it. Like Russell he is now telling Christians to leave their churches. All are apostate. You should no longer trust your pastors and elders, but you should abandon them and turn to one of the only true channels of God’s Word, Family Radio. Like Jehovah’s Witnesses, you should simply fellowship together and await Word from Oakland. In these new fellowships, there is to be no discipline, no baptism, no communion, and no authority apart from Family Radio’s interpretation of the Bible. Mr. Camping rejects 1 Corinthians 11:26 that says we are to proclaim the Lord’s death, till He comes. He rejects the clear teaching that the gates of Hades will not prevail against His church (Matthew 16:18). With even greater certainty than he had in 1994, Mr. Camping now says abandon the elders who provide watch over your soul (Hebrews 13:17), who are to shepherd the flock (1 Peter 5:1-3), and feed them (Acts 20:17-28). Do we no longer need shepherds other than Mr. Camping? Do we no longer need men to watch for our souls? Do we no longer need to be reconciled to brothers (Matthew 18)? If we do, what church is to judge it? Is Mr. Camping our pope who will judge for us? I’ve kept up with the publications of Harold Camping and he does have a lot of, one can say, crazy theories about the end of the world but I don’t hes a fraud. If anyone actually listens or reads his work, he says over and over that the bible makes references that when the “end” is near, a rise in false prophets will come fourth. Harold Camping is not trying to be a prophet in any means, he just says that hes trying to spread the world of the lord. *in response to Joseph* We know that Mr Camping is trying to spread the word of the lord but don’t you think we should take what he says and think about it? He has been consistently wrong, as the website shows, and we should practice restraint in believe his theories. Great discussion. I agree with both of you but remember the story of “A Boy who cried Wolf”? In this case, Harold Camping is crying wolf but its just cause he believes that there is a wolf (wolf=impending doom or event). In the end of the childhood story, there actually is a wolf and no one believes him… maybe Harold Camping will get it right this time. You wrote, “maybe Harold Camping will get it right this time.” That is impossible. We can easily know that he will not get it right this time. Yes, the fact that he was wrong before is a strong clue. However, you are right that this is not absolute proof that he will be wrong again. The proof is in the mathematical and logical errors he made in proving his Biblical Calendar of History. This is the one area we do not have any doubt. His errors are undeniable in this area. It doesn’t matter if you agree with his spiritual numbers, or his spiritual interpretations. God created all truth even the laws of math, logic, physics. Math does not lie. 2+2=4. It’s black and white. There is no gray. He predicts the year 2011 based on the assumption that his Biblical Calendar is accurate. His proof of the Biblical calendar is found in his book Adam When? (1974) This book has many mathematical and logical fallacies. I can show these to you. His explanation in these statements is mathematically incorrect. His calendar specifies that any calendar patriarch must be directly descended from the previous calendar patriarch. Having a “comparatively scarce” population on the Earth during a patriarch’s lifetime does not make it more difficult for him to have a descendant born in the year of his death? In fact, the “comparatively scarce” population of the Earth would have nothing to do with his claim that Adam did not have a direct descendant born in the year of his death? Mr. Camping asserted that Adam’s 930 years was not enough time for him to have a direct descendant born in the year of his death because “men were comparatively scarce.” His assertion is wrong. The “comparatively scarce” population of the Earth would have nothing to do with his claim that Seth did not have a direct descendant born in the year of his death. He asserted that Seth’s 912 years was not enough time for a direct descendant to be born in the year of his death because, “men were comparatively scarce.” His assertion wrong. This is especially strange logic since he teaches, with no reservations, that Levi, Kohath, and Amram each had a direct descendant born in the year they died. And they all live to be less than 140 years old! Again, my point is that having a “comparatively scarce” population on the Earth during a patriarch’s lifetime would not make it more difficult for him to have a descendant born in the year of his death? This is one of many, many, many, examples of Mr. Camping using flawed logic and flawed mathematics in his teaching. He disguises his errors by making his arguments so complex that few take the time to check his math. Adam’s descendants could easily have numbered over one million when he died at 930 years old. Mr. Camping’s suggestion that one of his male descendants would not be born in the year he died seems highly unlikely. In addition, Mr. Camping’s claim that the scarce human population would explains this is mathematically false. Think about it. Even if there were 10 billion other people on the Earth when Adam and Eve were created, none of these people could produce a descendant of Adam, except Eve (or other intimate partner if Adam committed adultery or remarried after Eve’s death). That concludes an explanation of one glaring example of the faulty thinking of Mr. Camping. I would be happy to provide you with many more examples of Mr. Camping violating God’s laws of logic and mathematics. Mr. Camping needs to be held accountable for teaching doctrines contrary to the Bible, and contrary to God’s mathematical and logical truths. Again, I can give you many more examples of Mr. Camping using mathematical and logical errors to prove his calendar, and would be happy to discuss this topic further. I do agree with you both. MB, do I also believe that Mr. Camping is a true Christian but is severely misguided. Without looking at specifics and rather looking at the overall theme of Mr. Camping’s theory lies a positive message of not taking life for granted and to live each day on this earth as an individual making positive impacts on one another. We do need to live each day as it is our last on this earth and I believe that was the overall message of the biblical scripture. I disagree with Mr. Camping that the bible is a warning device for future events about our world and that we need to begin preparations for our “ascendancy”. The bible continually promotes that idea that “good-ness” comes from our hearts and our inner selves and by altering our lives based on the endtimes, in my opinion, will not give one access to the kingdom of heaven. Marc, great points and great connections. I am in the process of getting a response from Harold Camping so that he may defend his theory. I do agree with everything you are saying and have come to the same conclusions about the flaws in his mathematical analysis. I will post his response if he does not respond via comment. In efforts to get the opinion of Harold Camping on this discussion, I have contacted a dear friend of mine which knows Mr. Camping personally and works for him on a full time basis. Here is a response to this discussion from my dear friend. As you know, the “end time” issue is a scary one. No one wants to face it. In Noah’s time, the Bible says no one believed, except Noah’s family. The Bible also states that almost everyone in the world today will not believe that Jesus is coming to judge the world at the end time, there is a remnant who will believe. So, there is no surprise to see lots of people don’t believe. And believing in the Bible doesn’t hurt. If we humble before God, is there anyone laugh at us? may be. But if it is true that Jesus is coming and we are ready in our heart to see Him, then it may be well with us. For those who are not ready, then they will know what will happen to them. And if we are ready, and for some reason, for example Jesus does not come then you are not to die on May 21, 2011. But that is just a silly thought, the Bible confirmed that Jesus is coming. Now about those who oppose Mr. C. There are hundreds and thousands of people both in the churches and in the world who are strongly opposing him, for many reasons. But look at all of the prophets in all time in history, people never liked none of them. People hated them; people hurt them; people imprisoned them, and most of them were killed by those who did not like to hear the message. The Bible says whoever speak the truth of the Bible is a prophet. In a sense we are all prophets if we speak about the Bible. It happened that Mr. C. has a platform that is very large around the world, so as a modern prophet of the Bible, then no body likes him. I agree if we look into the past. Mr. C. did make some mistakes. And that is how God wanted that Mr. must made those mistakes. But now at the very close to the end, God wants to correct those mistake so that we can see the truth. 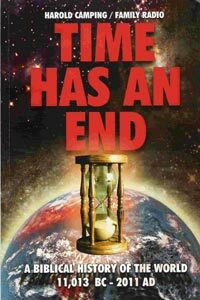 It is not mathematics that decides the day of the end time, but it is the whole Bible points to the day of the end time. Almost all people just want to jump to the conclusion that Mr. C made mistake or they can prove that they can do math. And all they do is to find the opposite idea or disagreement with the Bible. Bible does say about that, too. Well, I encourage you to read again the book We Are Almost There, and compare to your Bible. Try to spend time to read the Scipture references. Don’t ignore the Words of the Bible, they are more important than whatever Mr. C wrote in his book. Don’t believe Mr. C. right away, rather check with your Bible to see may be something here that the God is speaking to you. Even now, I study the Bible everyday, and I must say that I never understand the Bible like before, though I had 2 master degrees in theology. God is speaking clearly now about the end time and His process of judgment to the world. We must listen to God today. The Bible does not tell you to follow any one but God. Mr. C. though does not ask anyone to follow him or to join him as a cult, or to sell everything then giving to him before May, 21, 2011. In fact that he insists everyone to read the Bible and to believe in God only, and carefully listen to the message from the Bible about the end time. That’s all Mr. C. does. The previous post by a friend of Mr. Camping’s is misleading. His statement, “In fact that he insists everyone to read the Bible and to believe in God only, and carefully listen to the message from the Bible about the end time. That’s all Mr. C. does, ” is especially misleading. It is not true that that is all Mr. Camping does. He teaches false doctrines that hurt the body of Christ. Mr. Camping has the power, the platform, and the skill to convince many of his false doctrines which damage the body of Christ. Making the statement, “Don’t follow me, just follow the Bible,” does not excuse him of his false teaching. What if someone was able to convince many people to join the Christian Science Church. They would be guilty of spreading false doctrines. What if that person told each one of his converts not to follow him, but follow the Bible. Would that excuse him of teaching false doctrine? Absolutely not. What if we provided the Christian Science practitioner with Biblical correction. Would it be valid for the Christian Science practitioner to justify himself on the basis that all Biblical prophets were hated? NO! Would he be correct in saying that the fact that he is being rebuked for teaching false doctrines proves that he must be right on target? Of course not! Mr. Camping provides similar illogical excuses for not answering Biblical rebukes. He refuses to be accountable for his false teaching. You asked for clarification regarding Mr. Camping’s false claim that the Bible teaches that Levi was 21 years older than Joseph. I don’t understand how you can defend Mr. Camping if you don’t already know this basic information that forms the foundation for all of his sensational doctrines. Yes, Mr. Camping’s proof that Levi was 21 years older than Joseph is foundational to Mr. Camping’s doctrines. Strange, isn’t it? Mr. Camping’s false claim that he proved Levi to be 21 years older than Joseph is foundational to all his future errors. Let me explain why. Mr. Camping wrote a book in 1974 called Adam When? In this book Mr. Camping claims that the Holy Spirit enabled him to discover a Bible mystery. He claims that the Holy Spirit revealed to him a key in the Bible, a key that unlocked the previously hidden calendar of history. His explanation of the key is very complicated, so most people don’t take the time to check him out. They just assume that he is honestly providing proof of his calendar. But we must carefully examine his proof. We must see if his proof is indeed faithful to the Bible. And when we do diligently examine Mr. Camping’s proof to see if it is faithful, we find that his proof utterly fails. In Adam When? Mr. Camping explains his Biblical key to the calendar. He wonders if the Genesis genealogies could be a continuous calendar where each patriarch is born in the year the previous patriarch died (with some exceptions). This would give us a continuous time line of history from Adam to Abraham’s father. In order to prove his theory he looks at the genealogy of Levi during the 430 years in Egypt. He believed that if we add up the years of Levi, Kohath, Amram, and Aaron in Egypt, and they add up to 430 years, that would prove that his Biblical calendar teaching was correct. The Bible states that Levi lived 137 years, Kohath lived 133 years, Amram lived 137 years and Aaron lived 83 years in Egypt. However, the Bible does not say when Levi entered Egypt. Mr. Camping noticed that if Levi entered Egypt at age 60 his tally would work. But the Bible does not give this information. Mr. Camping notices that the Bible teaches that Joseph was 39 years old when Levi entered Egypt. So Mr. Camping needs to prove one thing: that Levi was 21 years older than Joseph (39+21=60}.. That would enable Mr. Camping to say that his calendar theory works for the 430 years in Egypt. And then he would apply the theory to the Genesis genealogies. When you read Mr. Camping’s confusing proof of the calendar you find that he never proved his key to the calendar! He admitted that he did not prove that Levi was 21 years older than Joseph. Then he assumed the calendar to prove that Levi was 21 years older than Joseph. That is circular reasoning. That is wrong. You can’t assume the calendar to prove your key to the calendar. That is deceptive and false teaching. Mr. Camping never proved his calendar theory. This calendar is what he uses as the foundation for all his other books regarding end time events. For instance in We Are Almost There, Mr. Camping invites his readers to send for the book Adam When? for proof of his calendar. If you don’t believe me, look on page eight of We Are Almost There! Look at the footnote on the bottom. Mr. Camping’s poorly written book, Adam When? is foundational to many of his sensational teachings. When we carefully analyze his proof of the calendar found in this book, we find that he assumed the calendar to prove the key to the calendar. That is utter nonsense, and must be rejected. We are not to trust in the speculations of a man. We must trust in the Bible only.